A self-leveling gypsum concrete with an impressive compressive strength range of 6000 – 8000 psi. 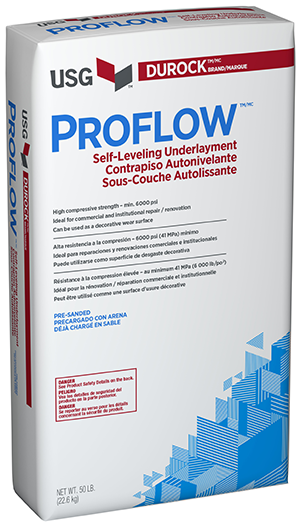 Durock Proflow Self-Leveling Underlayment applies over concrete slabs, pre-stressed concrete, and concrete planks. May also be used as a finished floor surface with an approved coating. Applies at thickness of featheredge to 3/4 in.